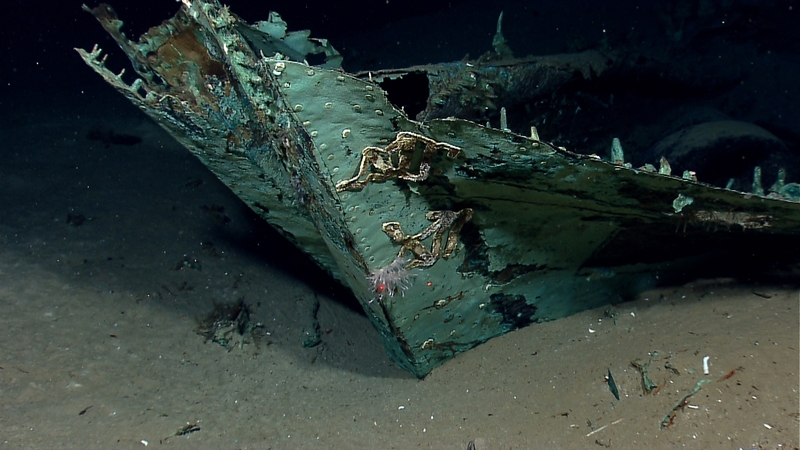 Scientists with the U.S. National Oceanic and Atmospheric Administration (NOAA) used remote-operated submersibles to discover a 19th century shipwreck in the northern Gulf of Mexico before an enthralled audience of 2000 watching via online streaming video. 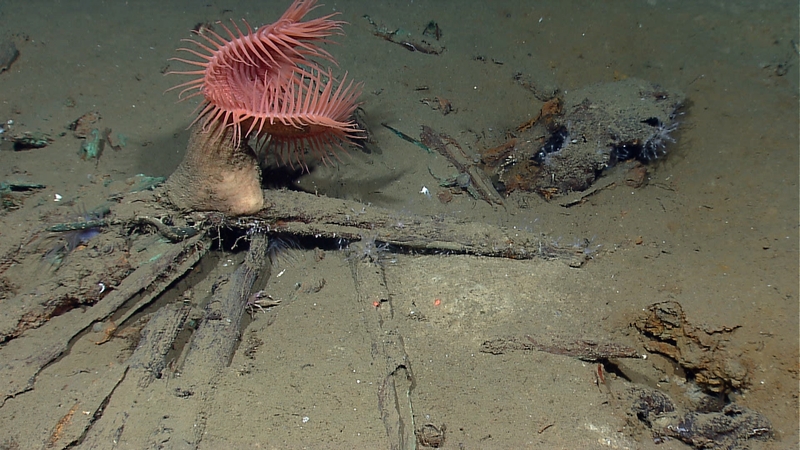 The wood of the hull had long since rotted away, but the high definition cameras captured gorgeous images of the surviving copper cladding that once protected the hull under the waterline. 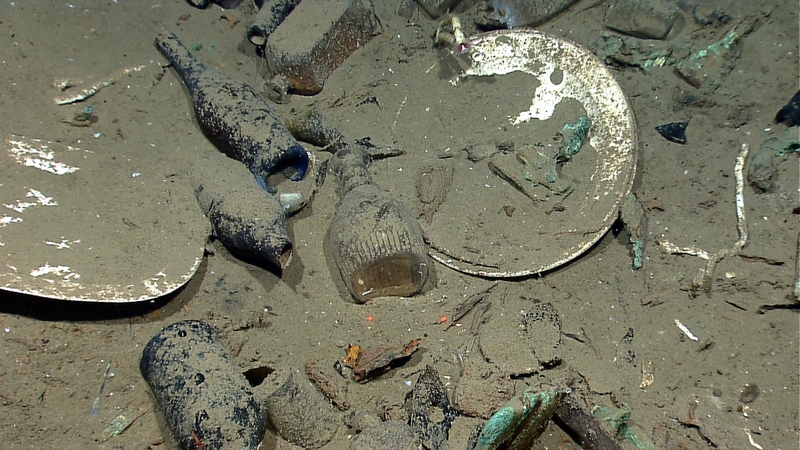 Cameras also revealed the anchor and a vast number of artifacts including cannons, boxes of muskets, glass bottles, ceramics and a rare ship’s stove that is one of very few surviving examples worldwide and only the second one ever found in the Gulf of Mexico. The ship’s name was not discovered, but the ceramic plates with a green pattern around the edges were popular between 1800 and 1830, and the copper sheathing suggests the ship dates to the first half of the 19th century, a busy time in the region. The War of 1812, the Mexican War for Independence, the Texas Revolution and the Mexican-American War all saw copious naval action in the Gulf during that period. The presence of muskets and cannons on board indicate that the ship was involved in wartime activities. One of the things that make this find so spectacularly photogenic is that the artifacts are perched on the sea floor, exposed to submersible view. The shipwreck site is deeper than 4,000 feet; it’s also 200 miles off the United States Gulf coast and the mouth of the Mississippi which is constantly depositing sediment into the Gulf. That not only makes for crisp images and exposed artifacts, but also allows researchers to figure out from the placement of the artifacts how the ship was used. Until recently, the area has been relatively unexplored. The wreck first pinged in 2011 when the Shell Oil Company surveyed the area for sources of oil and gas. The sonar information was vague, but was of sufficient interest for Shell to alert the Department of the Interior’s Bureau of Ocean Energy Management (BOEM) of something worth exploring. 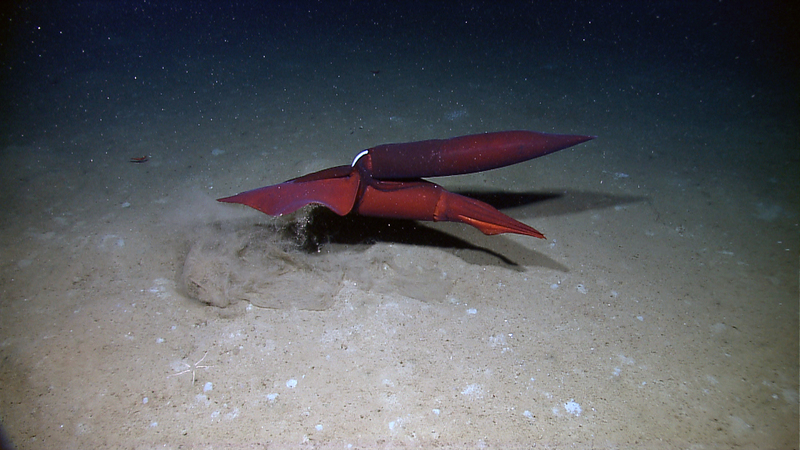 The BOEM asked NOAA to investigate this site and others during its mapping and diving missions this spring. The NOAA ship Okeanos Explorer set out for a 56-day mission in March of this year. They used multi-beam mapping sonar and a remotely operated submersible named “Little Hercules” to explore four potential shipwreck sites in the Gulf of Mexico. Little Hercules made a total of 29 dives, recording the wrecks and a great variety of underwater life, including some corals that the scientists watching on board and online had never seen before. This shipwreck was the last of the four and the most historically significant. Now the BOEM has to decide whether to give Shell a permit for oil and gas exploration/extraction that will disturb the seafloor. Here’s hoping the natural and historical wealth documented by Little Hercules will remain unmolested. Below is some of the footage the live viewers witnessed on Little Hercules’ April 26th dive, including the discovery of the anchor. For some truly jaw-dropping HD images of marine biodiversity captured during the mission, see NOAA’s photo and video log page. They are not to be missed, seriously. This entry was posted on Thursday, May 17th, 2012 at 11:57 PM	and is filed under Modern(ish), Multimedia. You can follow any responses to this entry through the RSS 2.0 feed. You can skip to the end and leave a response. Pinging is currently not allowed. I always asked myself if it is mandatory to have archaeologists within these projects on the surveying processes… Did Shell warn BOEM because they wanted to or because they could not pretend nothing happened?